Modernization is top of the IT agenda for Federal agencies. In addition to increased efficiency, accelerated performance, improved cyber security, and cost savings, the customer experience is a critical component to transformation and IT reform. From healthcare to national parks to taxes and more, constituents demand instant access, flexible services, and a seamless experience – so how can Federal agencies and today’s collaborative technologies better address CX-related activities to deliver substantive results? How can government and industry better collaborate to enhance the citizens’ experience? Join us on May 16 from 8-11 a.m. 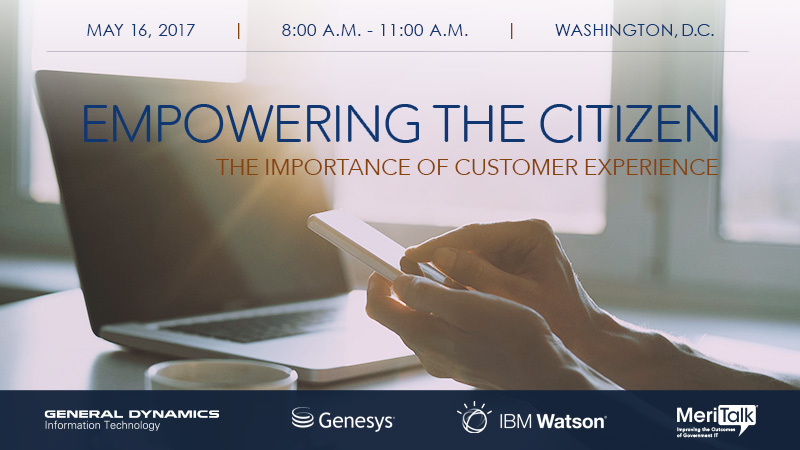 Learn from government speakers and industry CX experts, covering topics ranging from artificial intelligence and analytics to customer journey design and digital technologies. This event is open to government attendees only. Please contact Taylor Starkman at tstarkman@meritalk.com or 703-883-9000 ext. 101, should you have any questions.